The annual Exclusive Books Summer Sale is back on from 25 February 2015. Join us at your closest Exclusive Books branch and enjoy savings of up to 75% on a fantastic range of books. As always, we will have a special Fanatics preview on 24 February from 17:00 onwards, so bring your Fanatics card and be one of the first to see the amazing selection we have on offer. You will also earn Fanatics points on all your Summer Sale Purchases! With over 61 000kgs of stock at an average cost of R75 per book, you are sure to find many amazing deals! We have a R2000 End of Summer Sale shopping spree to give away to one lucky winner! To enter all you have to do is tell us what your choice for book of the year for 2014 is and write us a review of the book! The winning entry will be given R2000 to spend on any of the sale books at their nearest Exclusive Books store (this does not apply to airport stores). Reviews must be submitted by no later than 6 March to socialmedia@exclusives.co.za. The winner will be announced on 09 March and will have until 15 March to claim their prize. There is no word limit on the reviews but spelling, grammar and content will be taken into account when choosing a winner. Terms and Conditions apply. 7 Responses to Exclusive Books End of Summer Sale! Emails were definitely sent out to all of our Fanatics members who have selected to receive not only their quarterly statement, but also additional information from the Fanatics offers emails. According to our system when you signed up for Fanatics you opted out of the Fanatics offers emails, which include events, special offers and sale notifications. If you would like to receive these emails in future please let us know and we will update your account. Please let me know when and where the annual book sale is held in the Western Cape as I relocated from Johannesburg recently. We normally have a summer and a winter sale annually. The specific dates are published ahead of time here on our blog and on all of our other social media feeds. 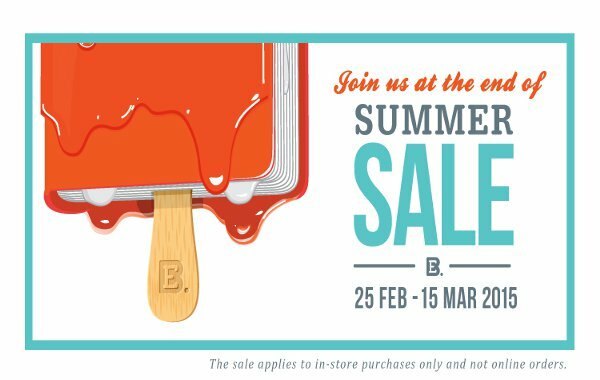 The summer and winter sales are held in all Exclusive Books stores nationwide.